The attempt at blending western classical music with jazz surely is no new concept; at the same time the possibilities and various approaches are far from exhausted and in desperate need of attention. German Guitarist Paul Peuker has been exploring different jazz realms with various formations for many years now and eventually founded the Peuker8 octet in 2011, leading to their debut recording Resound in 2014. 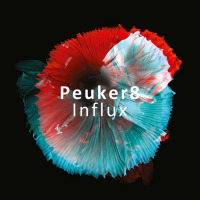 2018 sees said Octet releasing their sophomore effort, Influx, on which Peuker furthermore expands on intense explorations between jazz and classical music, profiting from the rich instrumentation of 3 strings (c,v1,v2), bass, saxphone, drums and piano. A question ever so often arising when confronted with a record that claims to fuse jazz and classical is which part is jazz and which classical? Or has a whole new blended entity been created? Maybe the enhanced instrumentation only alludes to classical music but in reality, it's just classically ornamented jazz? The latter is definitely a weakness of which many works of similar nature suffer: A string quartet is arranged in harmonious fashion and added to a standard jazz quartet formation whose explorations and interplaying subsequently suffer from the restraint to serve the harmonic accompanimenta vicious circle. While Influx does reveal symptoms of the weakness describing the above, there is definitely more to it. Opening with "Love Song," Peuker introduces a simple ostinato jumping a ninth upward with two subsequent drops in seconds, constantly repeated and therein laying the foundation of the entire 8-minute venture. The remaining instruments join in successively, in a slightly dissonant fashion, until fully establishing a melodious choir that contradicts the main motif in rhythmical and metric structure. Only half way through the song does Peuker relieve his guitar of it's simplistic duties and begins to solo over still ever-changing sequences. "The Skyward Escape" is composed of similar nature, this time being held together by the pianist's menacing and syncopated left- hand blows. Peuker proves that he is a team-player and only rarely takes the spotlight but enables equality amongst the players. While his sense for creating space for dialogue between the different instruments is remarkable and highly dynamic, the orchestral part of the ensemble thereby is pushed in the background and takes on a more ornamental role. Neither the strings nor saxophone ever take on an independent voice that serves as a counterpoint, nor do they harmoniously conform in polyphonic manner, thereby begging the question to what extent they are classically inspired? That said, the mentioned instruments do get opportunities for intense solos. Many of the 10 songs presented on Influx demonstrate long improvisational sections of all involved, thereby opening the structure and breaking up the tonal boundaries. "Fuge," at first, vaguely follows the rules of the classical musical structure which the title refers to: The piano introduces the main theme in the tonic, which is subsequently picked up by the violin in a different key while the piano develops a counterpoint. But this exposition does not strictly abide by all the rules: Even the second presentation of the theme already alternates by means of inversions and strays from the original material. The counterpoint in the piano is of more accompanying nature rather than independently led, up until the point the two instruments actually blend together in phrasing and harmony, portraying a pentatonic upward movement. During the course of the piece more and more instruments join in until Peuker gets a chance to present the theme on guitar as well. Thereafter "Fuge" is deconstructed and ambient improvisation takes over. This review was written upon reception of a promotional affiche which claimed the fusion of classical and jazz stood at this project's coretherefore the extensive comparing. The record is a compelling statement of constant inspiration filled with brilliant moments and blissful improvisations as well as beautiful compositions. But only very little influence of classical music shines through; neither 17th nor 18th, 19th or even 20th century. What the record does provide is a tight quintet at its core, colorfully accompanied by various instruments of different timbres. Track Listing: Love Song; The Skyward Escape; Grind Me Tender; Anthem; At Beinglas Farm; Metamorfosi; Fuge; Mnimi; Theme Music; Into the Wild White Yonder. Personnel: Paul Peuker: guitar; Clemens Christian Pötzsch: piano; Mark Weschenfelder: saxophone; Alina Gropper: violinquinton; Filip Sommer: violaquinton; Elisabeth Coudoux: cello; Eugen Rolnik: Bass; Florian Lauer: drums; Sissi Rada: vocals (Track 8).